We stayed in the Northern Rockies Lodge, Muncho Lake last night. We were told if our pocket book could afford it this was a great stop. Our pocketbook isn't doing very well but hey this is probably the only time we will make this trip so we hit it. 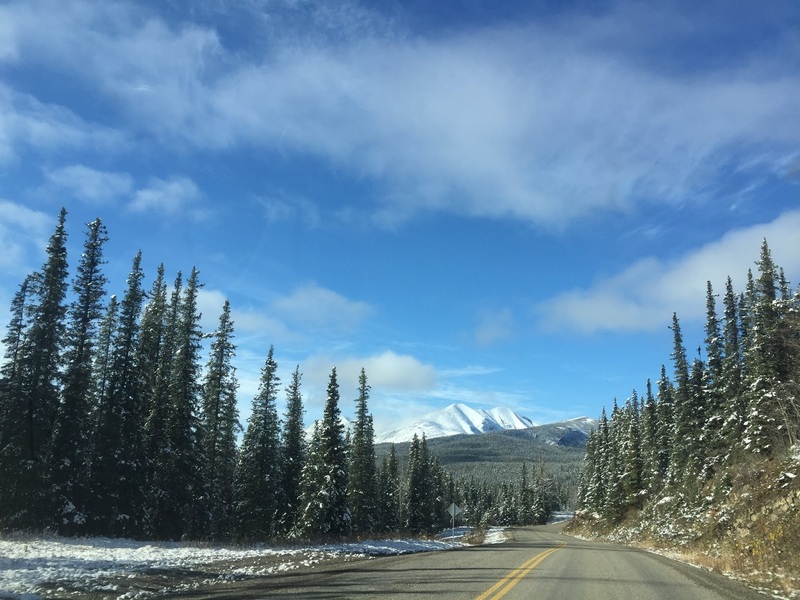 The drive from Fort Nelson was quite nice and we even had a wolf trotting down the opposite side of the road. At first we though it was a dog, then a fox and when we got close we realised it was a wolf. Muncho Lake and Lake Louise further south are considered the two prettiest lakes in the Rockies. We don't know which is better but since we saw this literature at Lake Muncho it probably means it is number two. But no matter it is pretty. The lodge is a giant log cabin and the only downside is the Internet was so slow no posting could be achieved. Today's run was also designed to be short. We had some small flurries and didn't want to be stuck having a long drive if the weather turned bad. We also wanted to stop at Laird River Hot Springs and have our first hot spring experience since leaving Japan. On the way to Laird we spotted a bear crossing the road. There was a car coming from the other direction as well so before either of us got close to him he turned around and scampered back into the trees. The board walk into the hot springs was covered with snow so we looked at each other carrying our bathing suits and said lets go look. We can always decide not to go in when we get there. The walk in is about 800 meters. Once we got there we found a very well built facility with several people enjoying the water. So we braved changing into our suits and hit the water. Great!!! Most of the visitors there were heading the opposite direction as us, but we chatted with several people and we soon realised we had been in for an hour already. We only stayed in the lower pools, there is an upper pool about 300 meters further up but we had read that it was closed due to bear sightings. Others said you could go at your own risk but we were comfortable where we were. After leaving Laird we really got into the wildlife. 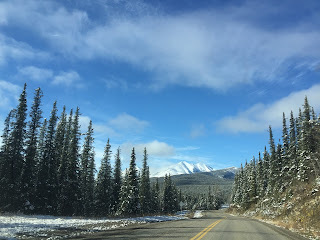 We had been seeing moose and bison crossing signs for miles but hadn't seen any. Just outside of the hot springs we came upon our first herd of wood bison. They were right by the roadside so we pulled over and snapped several pictures. We noticed the cars from the other direction just kept going past. After we had snapped a few shots and continued on we started to see why the cars were not stopping. Every few kilometers we went we would see at least one or two if not a small herd. And one place we had a very large herd on both sides of the road around a big curve. We also saw some road kills. One killed the vehicle as well. We saw the smashed up vehicle first and knew it had to be several hours old at least as there was snow all over it. A few feet further we saw the carcus of the animal. Not sure if it was a moose or a bison. Several miles after we saw a car from the other direction pulled off the side of the road. Just as we got close a moose cow scampered off into the woods. So the crash could have been either. We are at Watson Lake for tonight and will head for Whitehorse tomorrow. That should be our last night in Canada as we plan to then cross into Alaska the day after.